We redesigned our aLED-modules based on customer and market feedback. Here is a brief explanation on what is different compared to previous version. And why I think you should consider using aLED modules. Figure 1. New aLED Modules with examples of different connector locations. We have changed the design of our aLED module. LEDs are now placed on the center line of the module so the installation of optics is easier. aLED modules dimensions have also changed. New modules are now either 279.2 mm or 558.4 mm in length and 20 mm or 40 mm in width. It is now possible to order aLED modules with connectors either on the frontside or on the backside. Traditionally the connectors have been on the frontside, but these new backside connectors allow you to hide the wires behind the module and inside the profile. For longer luminaires, there is a possibility to use backline, so you won’t need long wires. Short wires to connect multiple modules together will be enough (figure 2). Figure 2. a) How to connect modules without back line option. b) How to utilize the back line option of the aLED modules. 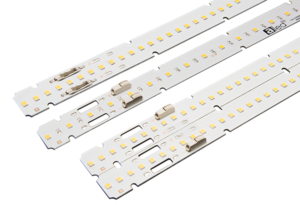 Thanks to the upgraded LED, the lifetime of aLED modules has also increased. You can see the lifetime prediction below. But to be brief: at maximum TC temperature (85°C) the lifetime (L70B50) is over 100.000 hours (figure 3). On top of high efficacy and the possibility to save energy, aLED modules are also recyclable. You can recycle all parts of module, even the PCB. In addition to all these changes aLED modules prices have also dropped to more competitive level. You can find the technical details of 4000K modules from the table below. You can download the datasheets of these new modules by clicking here. In addition to these new models, all our previous module models are also still available. This entry was posted in aLED, LED, LED module and tagged aLED, LED, LED modules on 18.10.2017 by Toni Kulikoff. Toni is the person responsible for Arrant-Light's marketing and communication. With a little knowledge of the technology itself, Toni's posts are mainly written without a technological angle. Why Heat Pipe is Better than Traditional Heat Sink? Microwave Sensors: How to Utilize Them in Lighting?